Violent computer games arouse more impulsive parts of the brain than non-violent games, an American study has found. The study followed 44 teenagers aged between 13 and 17 without any history of behavioural problems. It found that playing violent games increases the activity of amygdala, neurons in the human brain connected to emotions and impulses. Researchers are now asking whether this activity can lead to permanent changes in behaviour. 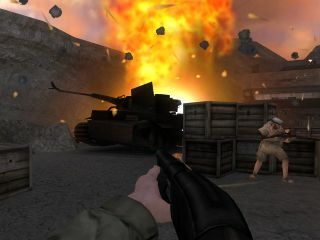 The children were asked to play 30 minutes of either first-person shooter game Medal of Honour: Frontline, involving military combat, or the non-violent Need for Speed: Underground. They then completed a series of tasks requiring concentration and processing of emotions, whilst researchers studied their brains using magnetic resonance. The researchers were able to register changes in brain-functions that reflected changes in blood flow, and could see how the activity in the amygdala changed. For those who had played the violent Medal of Honour game, an increased activity in the amygdala was found. However, the activity in the prefrontal cortex - connected to our control and concentration powers, as well as moral and ethical decisions - decreased in the sample group that had been playing the non-violent Need for Speed game. "Our study suggests that playing a certain type of violent video game may have different short-term effects on brain function than playing a non-violent, but exciting, game," said Dr Vincent Mathews, a professor of radiology at Indiana University School of Medicine in Indianapolis and the study's author. Several behavioural and cognitive studies have shown a link between violent behaviour and exposure to violence in media, including violent films and games.